It didn’t take long for the Gold American Eagle to establish itself as one of the greatest and most recognized gold bullion products in the world. First introduced in 1986, collectors and investors were immediately drawn to the impressive design and quality of the Gold Eagle. 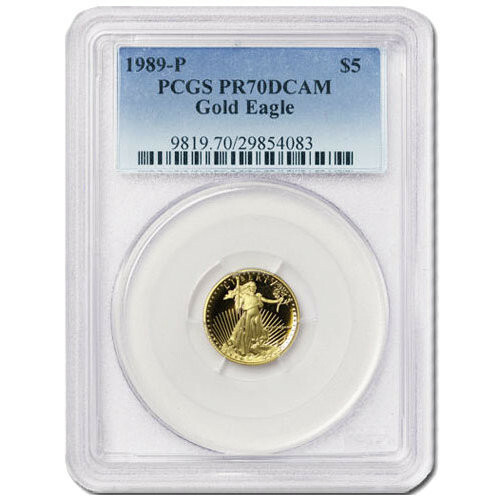 Now, you can purchase a 1989-P 1/10 oz Gold American Eagle with PR70 grading from the Professional Coin Grading Service on Silver.com. The “P” mint mark on these 1989 1/10 oz Gold American Eagle identifies the coins as a product of the Philadelphia Mint. A PR70 grade from the PCGS is reserved for coins that are considered perfectly struck by the mint and have not accrued any blemishes or scuff marks since they were minted. DCAM designations are used on coins with a strong, frosted design laid over a clear, deeply mirrored background field. On the obverse is Augustus Saint-Gaudens’ depiction of Lady Liberty. She can be seen striding forward with her torch held aloft as a guiding beacon. Engravings include 50 stars, representing each state, “Liberty,” and “1989.” The reverse displays Miley Busiek’s family of eagles, with a male returning to a female and hatchlings in the nest. Engravings read “United States of America,” “E Pluribus Unum,” “In God We Trust,” and the physical descriptors of the coin. Today, it operates four primary mints and is responsible for producing the Gold American Eagle Coin in uncirculated and proof variations. If you ever have questions about these coins or other Silver.com products, our associates are available toll-free at 888-989-7223 or online using our live web chat.